It's so hard to pick just one. Basketball jerseys on non-basketball players: Perfect for showing off one's armpits in polite company. But if you're trying to dress it up a little, don't cover up -- just don one of these fancy-schmancy b-ball vests: satin lining, mesh outer, and buttons running straight through the team and/or player you're trying to impersonate. Yep, nothing brings the class like one of these babies, designed by "young Parisian fashion designer" Nelson. He only has one name, so you know he's got to be good. For a mere 175 euros (that's $242.19 U.S. -- hardly a car payment, after all! 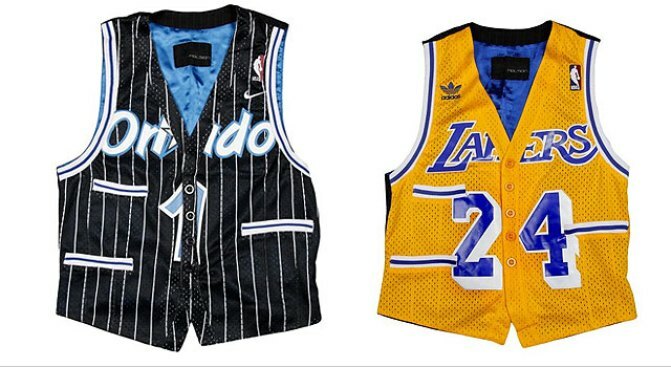 ), you choose from Orlando (#1), Lakers (#9, white, or #24, yellow) or Celtics (#5 or #34). Don't like those teams? Tough. That's all you get. Yeah, so maybe they're not as good as L.A. Clippers President Andy Roeser's super-duper draft-lottery suit lining. But not everyone gets to be president, after all. Posts Chris Littmann on SportingNews.com: "Every time I look at them, I notice something new. Those freaking pockets with an edge made like the jersey trim? Sold. I'll take a dozen, good sir. Another place you should definitely consider wearing these: on your wedding day, as a vest under your tux." Just the groom? Why not the entire wedding party?